AMIX Grout Plant (AGP) was built to produce a grout for pavement areas that are subject to heavy and/or slow-moving traffic, or where a durable, hard-wearing, impermeable, and fuel-resistant surface is required. 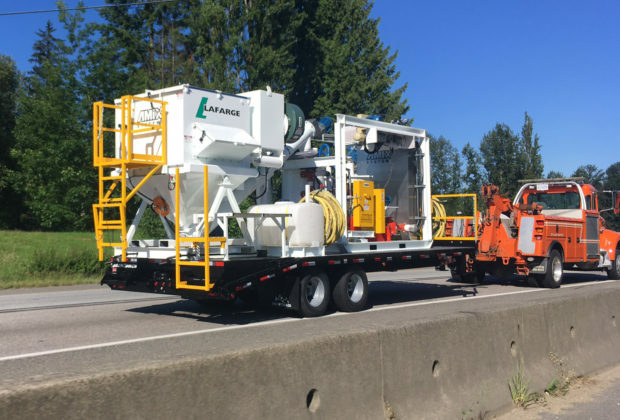 Lafarge Canada Inc. retained AMIX in procuring a grout mixing unit to improve placement of Duratough grout and provide solution to unique paving challenges. 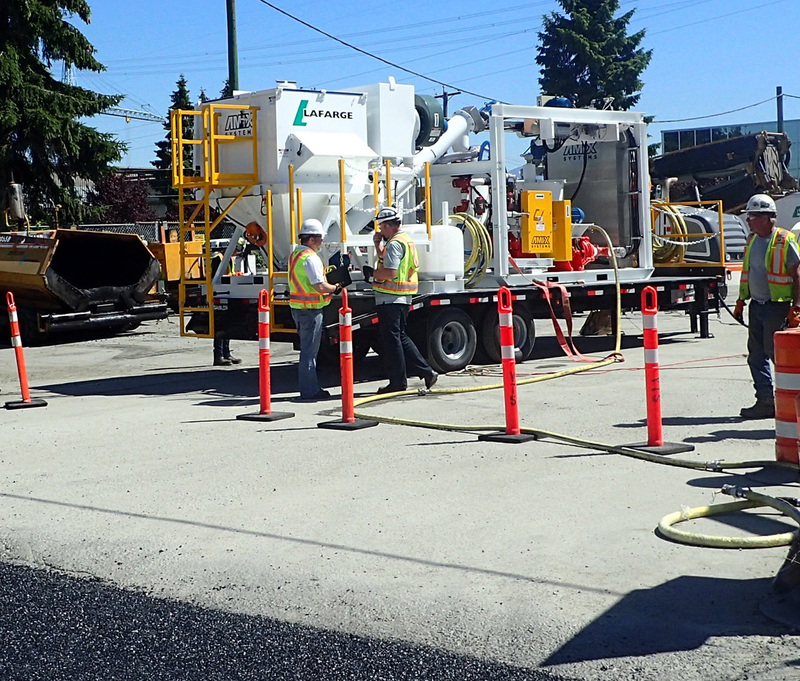 Lafarge construction businesses provide complete road construction services for commercial, residential, airport, municipal, and highway projects across Western Canada and the Western United States. Lafarge construction needed a system that would provide a cost-effective alternative to concrete, where construction speed and application of traffic are factors. AMIX Systems provided a conceptual design and built a fully automated small scale high shear colloidal mixing grout plant. The AGP-Typhoon is a modular design that was mounted on a trailer for easy mobility and access to project sites. The AGP-Typhoon successfully provides a more robust, reliable, faster method in repairing pavement, reducing downtime on highway and road projects. AMIX Grout Plant (AGP) is simple to operate, low maintenance, compact having a low carbon footprint, highly mobile and easily accessible to site. The AMIX Grout Plant (AGP) allowed Lafarge to quickly mobilize and make repairs quickly reducing traffic and delays. AMIX Grout Plant (AGP) required little or no operator intervention, minimal clean up, no waste while producing high quality grout mixes within customer specifications. 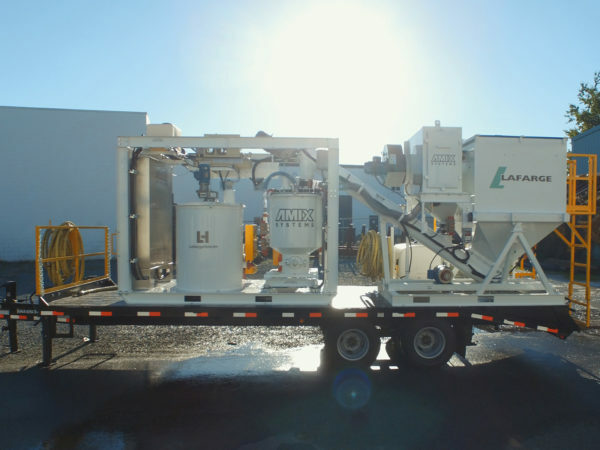 Construction Performance Manager - Lafarge Canada Inc.
AMIX Grout Plant (AGP) was used to eliminate multiple mixing systems, providing high outputs while maintaining a low carbon footprint. 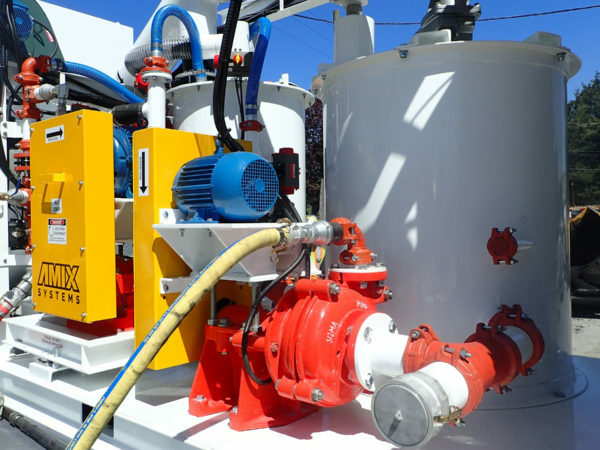 AMIX High Shear Colloidal Paddle Mixer (ACM) 4000 was built to produce a grout slurry for mixing with aggregates that was high in cementitious powder with a low water solids ratio producing a flowable, pumpable mix.